Mexican hat dance steps have been taught to generations of school children, as it is a gleeful cultural dance that is easy and fun to learn. However, you don't have to be in elementary school to enjoy this whimsical choreography - anyone can dance the Mexican hat dance and perform it quite well. You can perform the Mexican Hat Dance either by yourself or with a friend. All you need is to be able to count to four and follow a basic rhythm. Start by standing with your feet together and your arms relaxed at your sides. Fold your left arm across your stomach and set your right elbow on your left hand so that your write hand is palm opened to the audience. Move your right hand back and forth as you put your right heel out in front. Reverse step one, so that your right arm rests across the stomach with your left elbow on your right hand. Again, wave your left hand back and forth as your left heel goes out in front of you. On count 4, clap twice very quickly. You then repeat these four steps seven times. If you are using traditional Mexican Hat Dance music, you will hear the music change after you have completed seven steps of what is described above. At the music change, clap four times and then raise your arms up in the air, exclaiming "olé!" for extra fun and expression. The music will then restart, so you will repeat it all, going faster each time. If you choose to have many partners dance at once, all of the dancers can come together at the end to make a complete circle and sidestep in an agreed-upon direction until the music is over. Mexican Hat Dance steps are very energetic and a great way to have young students burn off some energy and bring some laughter into an otherwise humdrum day. If you want to purchase authentic Mexican Hat dance music, you can try a CD such as A Trip to Mexico. Having real music designed for this peppy dance will add to your performance, and will teach your students a fun skill they will remember for years to come. If you happen to know someone who plays mariachi music, you can ask them to come play for your performance. Live music will only add to the authenticity and charm of your dance. When rehearsing or performing Mexican hat dance steps, you can wear whatever you'd like. 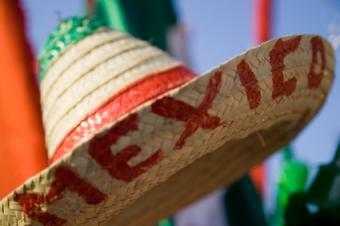 However, it can be fun to wear traditional Mexican shirts and dresses, and of course to have a few sombreros on hand. You can place a large sombrero in the middle of the dancers so they dance their steps toward the hat and then circle around it at the end. You can also have each student wear a sombrero that was either purchased or decorated in class or whatever sort of meeting your dancers gather at. Mexican hat dance steps can be altered or added upon depending upon the age or size of your group. Get creative and have fun, watching videos or reading up wherever you can on the traditions and culture of Mexico. This will further inspire you to practice and enhance your dance steps in time for your class performance or anywhere else you are lucky enough to participate in this fun tradition. Try the steps at a community Cinco De Mayo celebration, a Mexican themed birthday party, or at a cultural fair put on by a local recreation center or school.